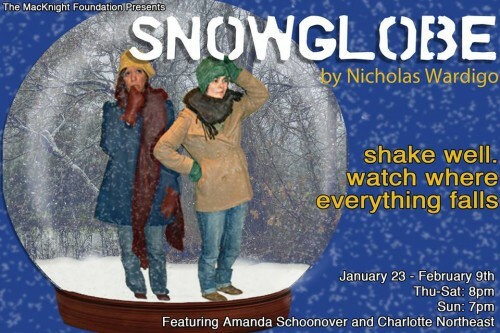 Snowglobe is a drama in one act without intermission with two characters: INGRID (female) and SONJA (female). Ages are unimportant, but both women should be the same age. The universe is shaped like half a sphere with a diameter of about fifteen feet. It contains exactly three trees, two women, and one house that is tragically out-of-scale with the women. When it snows, it isn’t real snow, but something akin to shredded gum wrappers. The women don’t particularly like one another. Like most human beings, the women are curious. Exploring the universe isn’t the problem…that only takes a few minutes. Deciding what it is, how it got there, and what their place in it is…that’s going to take some debate. Oscillating between comedy and philosophy, Snowglobe is an irreverent, microcosmic, metaphysical dismantling of science and religion, set within the confines of a coffee-table tchotchke.